Diamond Creek is California's first exclusively Cabernet Sauvignon Estate Vineyard. It was established in 1968 by Al Brounstein, a visionary pioneer who planted Bordeaux varietals on secluded Diamond Mountain in the northern Mayacamas Range of the Napa Valley. 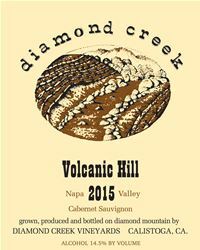 The Diamond Creek property has three separate vineyards: Red Rock Terrace, Gravelly Meadow and Volcanic Hill, each with a distinct microclimate and soil type. In certain years when conditions produce an exceptional wine, a Lake Vineyard Cabernet Sauvignon is released.